"A heart-pounder.... With this remarkable work, award-winning investigative journalist Terry Gould takes the reader on a madcap, pulse-quickening race across the far reaches of Asia.... 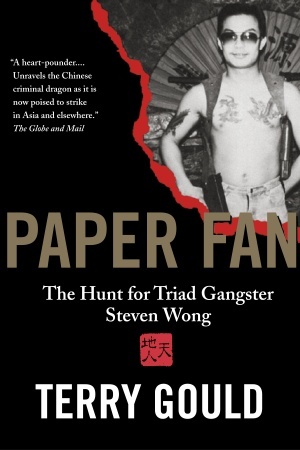 This work is among the most provocative and well-written texts on Asian organized crime that I have read in years"
What investigative reporter Terry Gould said about 14K Triad mobster Steven Wong: "Every criminal has to have somebody on his case. For Steven Wong, I'm that somebody." What Steven Wong said about his nemesis, Terry Gould: "If you were Chinese and you wrote this, you'd be gone." Back in 1990, a cocky 26-year-old Asian mobster named Steven Wong answered a knock at the door of his mansion in Vancouver and invited reporter Terry Gould into his living room. Neither of their lives would ever be the same. Steven Wong was head of the Gum Wah Gang, suspected of heroin trafficking, 14K Triad status and bloody murder in the streets of Vancouver. Gould, wearing a wire and secretly recording Wong for a ground breaking two-part CBC TV exposé, was getting to know the "destroyer of lives who became my life's work, my life's study, my obsession." After Gould's report aired the RCMP had to put him under a protection program and Wong came under intense police scrutiny that resulted in his arrest for masterminding a heroin conspiracy. The cops had never been able to put Wong behind bars, but the gangster was suddenly looking at a possible 20-year sentence. As far as Gould was concerned a conviction would have been a happy ending, but Wong was far too clever for that. Instead of sitting still and waiting for his trial, in 1992 he took out a million-dollar insurance policy and then persuaded a B.C. judge to give him back his passport. The next thing Terry Gould knew, Wong's parents and friends were weeping over a plot in a Vancouver cemetery, and insisting that the young mobster had been killed in an accident in the Philippines. Wong was about to find out that faking his own death was easy - evading Terry Gould: impossible. For the next 12 years, Gould tailed the man known as the Paper Fan through the organized crime circles of six countries. This riveting, horrifying, yet often hilariously funny book is the story of the hunt - a daredevil journey through the seductions and terrors of Steve's world. Wong's urn was interred in a Vancouver cemetery, but for most of his busy afterlife Interpol had a Red Alert arrest warrant out for him. His file read like a Hollywood action film, a post-mortem panorama of organized criminal adventure that circled the Pacific Rim, from Macau to Japan, from Cambodia to the Philippines. Gould's search took him deep into Steve's world, a dangerous shadowland where politicians, police, businessmen and criminals were often indistinguishable from one another - in each other's pockets, and in each other's favor. At one critical point the former chief of the Philippine National Police, Senator Panfilo "Ping" Lacson, was working closely with Gould, and seemed to be the key to finally nabbing Wong. A failed revolution backed by Lacson interrupted the hunt and once again Wong slipped away, or perhaps Lacson was only going through the motions of catching Wong. According to a Philippine Senate investigation Gould recounts in Paper Fan, Lacson may not have been the crusader against organized crime and corruption he claimed to be, but up to his eyeballs with the 14K. Four times, Terry Gould tracked the Paper Fan through Asia's circles of corruption, and pinned him down. Each time, the law let him slip away. In the world of organized crime that Wong inhabits, the rise to political power is always accompanied by the return of favors, and smart gangsters get their favors returned in the currency of impunity. Paper Fan is the breathtaking account of Terry Gould's risky personal quest to end such impunity. "Paper Fan is perhaps the first work that critically analyzes and unravels the Chinese criminal dragon as it is now poised to strike in Asia and elsewhere... If ever a book has captured the gaudy tones of modern Asia, this is it.... A compelling page-turner...it packs more information into its 482 wonderfully textured pages than there are noodles in Aberdeen's floating restaurant." "With verve, style and humor, Terry Gould leads readers on an unforgettable journey into a ruthless underworld populated by gangsters and one almost mythic, but undeniably ingenious mobster who transcends them all. A remarkable story told by a remarkable storyteller." -- ANDREW MITROVICA, author of Covert Entry, winner of the 2003 Arthur Ellis Award for best non-fiction book of the year. "Gould pursues his prey with the relentless fervor of an Indiana Jones - and takes you along for a fearful yet funny ride through the underworld." "Southeast Asia is like this. Asian organized crime-in Vancouver or Hong Kong-is like this. Great stories contain such trajectories and great investigative journalists display such compulsions. Paper Fan is unbuttoned and out sized and wonderfully wild." "With this remarkable work, award-winning investigative journalist Terry Gould takes the reader on a madcap, pulse-quickening race..."